World-renowned soil microbiologist and sustainability expert, John Doran, has dedicated his life to meeting the needs of people and taking care of the earth’s resources. As someone involved with Community Crops since its inception, he has contributed his knowledge, time, and funds to help create a community in which not only vegetables flourish, but people as well. 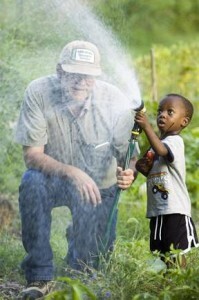 John’s main priority is to promote stewardship awareness within the Community Crops gardens. In the end, the bottom line is to love one another and to care for the earth. Originally hailing from the east coast, John moved to Lincoln in 1975 with his wife Janet to work for the USDA. After winning an Onassis International Prize for the Environment, John created the REAP Fund, a charitable gift fund meant to sponsor local efforts for sustainable and healthy practices. In 2003, John partnered with Community Crops to establish their first garden plot at 23rd and P Streets. He helped transform the empty lot, used as a common dumping ground, into a thriving community garden. With this success, the next year John coordinated the creation of a new site on the property of his local church. Each garden is like a little oasis in Lincoln. And we went to drip irrigation lines so that we’d reduce the dependency. Again, meeting the needs of the people but also taking care of the earth.